Isaac Newton gave credit to his predecessors for his phenomenal vision and insight with the phrase that he was “standing on the shoulders of giants”. But just who were those giants? Foremost amongst them must have been Galileo, who formulated some fundamental mechanical principles that underlie Newton’s work in dynamics. But there were many others. The greatest English mathematician prior to Newton was John Wallis. 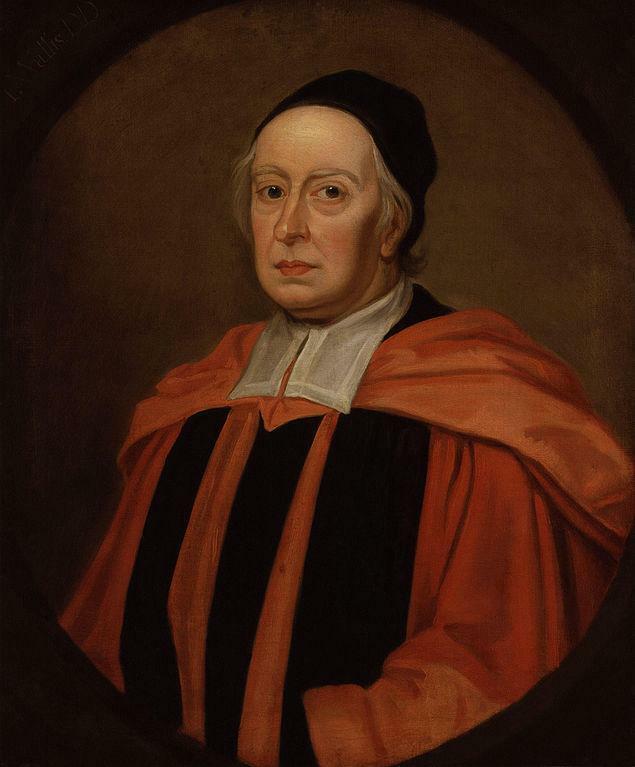 John Wallis (1616–1703) [Image Wikimedia Commons]. Wallis was a charter member when the Royal Society, one of the oldest scientific organizations in existence, was founded in 1660. Other early fellows include Newton, Robert Hooke and Christopher Wren. The mathematical work of Newton and Hooke is well known, but Wren, famous as the architect of St. Paul’s, also made significant contributions to mathematics: he found the arc length of the cycloid, an important problem at the time. Wren also posed the challenge, to find the force law yielding the planetary orbits that had been observed by Kepler. This led ultimately to the publication of Newton’s Principia. Wallis, who had been educated in Cambridge, was appointed in 1649 as Savilian Professor of Geometry at Oxford. He published two important books, on analytic geometry and on infinite analysis, the two mathematical areas of primary interest at the time. The latter book, Arithmetica Infinitorum, which appeared in 1655, was influential in Newton’s formulation of infinitesimal calculus some years later. Wallis managed to calculate the areas enclosed by a range of curves, one of the key goals of integral calculus. In the course of this work, Wallis introduced the now-familiar symbol ∞ for infinity, a figure of eight lying on its side. The symbol ∞ for infinity, introduced by John Wallis. Wallis’s work showed great insight but was lacking in rigour. It came under criticism from Fermat, and also from Wallis’s countryman, the philosopher Thomas Hobbes, who referred to the Arithmetica Infinitorum as “a scab of symbols”. However, Wallis and Hobbes had been involved in a long-running, acrimonious and public dispute in which neither of them was above reproach. Moreover, Hobbes claimed to have squared the circle, a process later shown to be impossible. The first term gives 2, the product of the first two gives 4/3, the first three 16/9 and so on, becoming successively closer to the ratio π/2, which is about 1.5708. Wallis’s formula is not useful for evaluating π, as its convergence is very slow. Faster methods have yielded some trillion significant figures for π. But the formula is of both theoretical and historical interest. Wallis is also credited for introducing the idea of the number line, where the whole numbers are arranged in order, equally spaced along a line, with fractions and more exotic numbers intervening between them. He also established the notation for powers, with both whole-number and fractional indices, that we use today. Wallis’s genius was not confined to mathematics. He was chief cryptographer for Parliament and, later, for the Royal Court. He studied the tuning of organs, supporting the equal temprement scale. He wrote an work on English grammar. And he published on theological topics. Although not established with water-tight arguments required by the standards of today, Wallis’s mathematical results provided crucial guidance to those who followed him. The mathematical historian Carl Boyer remarked that the work of Wallis provided a good illustration of the fact that “an occasional disregard of the demands of logical rigour can have a salutary effect on progress”.